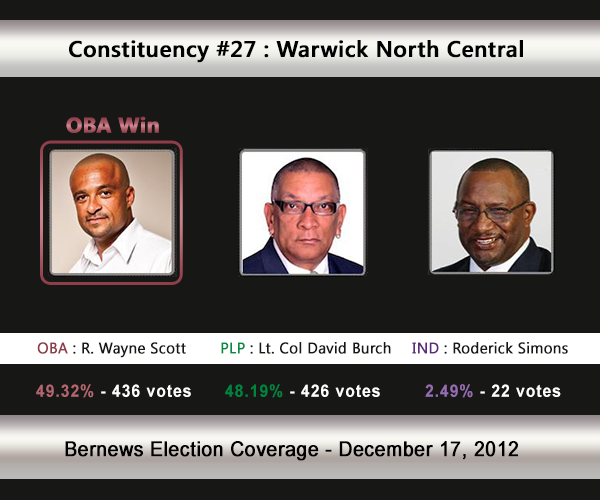 [UPDATE Dec 17: Election Results] R. Wayne Scott [OBA] has defeated Lt. Col David Burch [PLP] and Roderick Simons [IND] in C#27 Warwick North Central. The One Bermuda Alliance will be represented by R. Wayne Scott, while Lt. Col David Burch will stand for the Progressive Labour Party. Roderick Simons registered as an Independent candidate for C#27 on Nomination Day. Whoever wins this constituency will be a new MP for the area, as the incumbent Elvin James [PLP] decided not to stand for re-election. In the 2007 General Election, Mr James won 56.14% [535-418] of the vote vs the UBP’s R. Wayne Scott. In the 2003 General Election, George Scott [PLP] won with 58.13% of the vote against Yvette Swan [UBP] who received 41.87%. 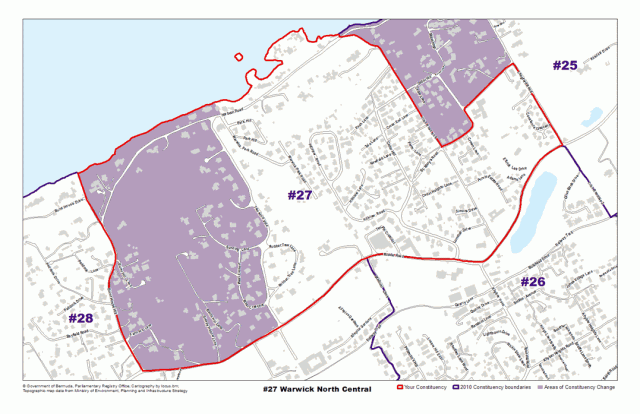 Areas the Warwick North Central constituency compromise, or is located by, include Harbour Road, Longford Road, Tamarind Vale and a host of smaller islands including Darrell Island, Burt Island, Grace Island, Alpha Island, Beta Island, Gamma Island, and Delta Island. Former Bermuda Regiment Chief Lieutenant David A. Burch has served his country for much of his adult life first in the Bermuda Regiment from which he retired as Commanding Officer in 1997, and the Progressive Labour Party (PLP) as adviser and Cabinet Minister in various PLP administrations. His career path is reflective of his desire to employ his leadership skills, business acumen, knowledge of the complexities of Government for the benefit of the people of Bermuda and the youth in particular. Colonel Burch was the PLP candidate for Smith’s South in the November 1998 election when although unsuccessful, he won a substantial number of votes. From then on, Colonel Burch’s work ethic and passion for serving the Bermudian people led him to accepting a series of appointments in the Government. 1998: Government Senator and Chief Of Staff to the Premier; Parliamentary Secretary for Labour, Home Affairs and Public Safety; Parliamentary Secretary for Works and Engineering and Transport Minister of Labour; Government Leader in the Senate and Minister Without Portfolio; Minister of Housing; 2005: Consultant to the Ministry of Works and Engineering and Housing to spearhead the amalgamation of the West End Development and the Bermuda Housing Corporations. 2005: Minister of Public Safety and Housing; and 2010: Minister of National Security. Colonel Burch was educated at West End Primary, Southampton Glebe and Sandy’s Secondary. He is also a product of two of Britain’s best military schools: The Royal Military Academy, Sandhurst, and The School of Infantry, Warminster. He has attended training and attachments to military units in the United Kingdom, Canada, Belize, Jamaica and the United States. He retired as Commanding Officer of the Bermuda Regiment in 1997 after 20 years of active military service. His military awards include the Efficiency Decoration in 1990 for outstanding military service and the First Clasp in 1996 and in 1998 and Officer of the Most Excellent Order of the British Empire, Military Division. He is now a private consultant with his own firm and continues his passion for serving his country. He was selected to represent the PLP for Warwick North Central in the next General Election while continuing his involvement with the community in a number of voluntary activities. Wayne Scott grew up on Spice Hill Road near Warwick Holiness Church. He has spent his life in Warwick and lives on Ord Road with his wife, Kim. Wayne has two grown daughters. His family also includes former Premier, Alex Scott, the late Deputy Premier, John Irving Pearman and the Speaker of the House, Stanley Lowe. Wayne has spent most of his career working in IT & telecommunications in both Bermuda and the U.S., and has served in senior management positions for the last decade. Wayne graduated with a bachelor of science degree in computer science from Atlantic Union College in Massachusetts and earned a master’s degree in finance and management in 1997. He is an avid cyclist and has represented Bermuda at the national level in international competitions in China, Switzerland, Guernsey, Greece and throughout the Caribbean. He competed for several years in the United States as well. Wayne ran for Parliament in the 2007 general election. During that period, he was successful in creating a playground on the Warwick Parish field next to the Lorraine Rest Home and worked on other Warwick community projects as well. Wayne has coordinated numerous community meetings, events and get-togethers. He continues to work with area residents on their various needs. He understands the growing problems that plague Warwick – particularly the economy, education, crime and the challenges facing young people. “These are problems that concern all of us in this very small community. In common with everyone else, the people in Warwick are suffering from the mismanagement of the economy over the last few years. I believe there is a real need for change. Roderick “Roddy” D. E. Simons is part of the fabric of Warwick, the son of Joan and Roderick Sr. He grew up on Simons Drive, a stone throw away from St. Mary’s Church. He still lives there today, soothed by the lusty ringing of the bells of St. Mary’s, bidding him to get out and start the day in the service of Warwick and Bermuda. Roderick has two grown daughters and a sister. Roddy attended the Purvis Primary School. He went on to the Berkeley Institute, York University and Shaw Business College, majoring in Business Administration and Ac-counting. He has also earned many accreditations . He is most proud of the designation from the American Bankers Association, which bolstered his skills and knowledge in financial services. His family harkens back to his grand father, H. Earlington “Early”, who supplied food and sustenance to the good people of Warwick through the family–oriented Simons’ Super-ette on Khyber Pass (now still an essential landmark through the Amis Funeral Parlor establishment). “Early”, the jolly gentleman of Warwick and the Simons ‘byes’, excelled in their en-terprising services and civic duty to the good people of Warwick West. Roddy is adding one more chapter to the Simons family tradition of community service by standing as an Independent Candidate for Warwick North Central Constituency #27.
work on boosting employment levels by rejuvenating the economy to encourage development and growth. offer creative strategies for the Tour-ism Experience in Bermuda. improve the Hospital Insurance Plan and Pension Entitlements for our growing number of Seniors. overall, enhance the quality of life within the neighbourhoods of Warwick, and on a national level. Roddy ran for Parliament in the 2007 General Election. Roddy’s consistent hard work and genuine appeal drew him far more supporters to the extent he was a mere 200 votes behind the former Premier and a seat in Parliament.